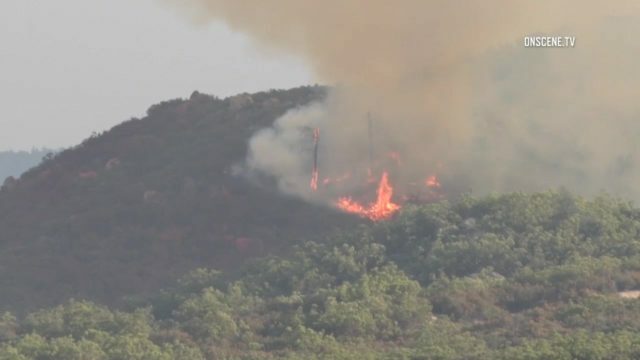 A wildfire that blackened 255 acres of brush in the rugged northeastern reaches of San Diego County was 100 percent contained Thursday, officials said. The so-called Lost Fire, which ignited Saturday afternoon about four miles northeast of Warner Springs in the vicinity of state Route 79 and Lost Valley Road, was brought completely under control Wednesday night, Cal Fire San Diego Capt. Kendal Bortisser said. Fire crews will continue to monitor the site to ensure there are no hot spots likely to flare up, Bortisser said earlier Wednesday. The Lost Fire ignited a little after 3 p.m. Saturday, quickly scorching more than 100 acres in less than two hours, prompting voluntary evacuations Saturday night in nearby Chihuahua Valley and closing several small rural roads. All evacuation warnings were lifted and all roads were opened by Monday morning. More than 400 firefighters from Cal Fire and the U.S. Forest Service fought the blaze from the ground and air, with ground crews battling “steep terrain, access problems and high temperatures,” Bortisser said earlier this week. But the crews got a boost Monday from a rainstorm that doused the region. After the flames were knocked down, prison inmates working on Cal Fire hand crews helped to dig a line around the charred area, ensuring there was no fuel if the flames did flare up again. Firefighters had the blaze 10 percent contained Saturday night, about six hours after it was first reported. It was 40 percent contained late Sunday, 60 percent contained Monday, 85 percent contained Tuesday and 95 percent contained Wednesday morning before it was brought under full containment later Wednesday.